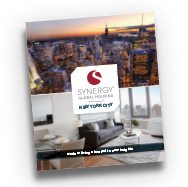 Where convenience and luxury meets affordability in the heart of New York City! Among luxury high-rise buildings, world-class art galleries, and a thriving entertainment scene sits Chelsea’s newest standout residential property, Synergy Chelsea. This newly constructed 17-story building boasts a beautiful rooftop terrace allowing for spectacular views of The Big Apple, as well as a top-floor recreation room and bike storage facility. Completely managed by Synergy, Synergy Chelsea will redefine the traditional short stay experience in New York through elevated in-unit packages. Guests will enjoy an enhanced furniture package, as well as a host technology upgrades, such as 200Mbps wireless internet and a 55” smart television and voice activated concierge for local info and maintenance requests. Synergy delivers a unique guest experience through customer service and technology. Copyright 2019 © Synergy Global Housing 2018. All rights reserved.